“You’ll want to get in touch with Queen Rukiya and Chief Howard”, Cherice advised. We’d been working together for several years and, ever the teacher, Cherice felt it would be helpful, expansive, for me to meet other members of the community, to work with them and learn from them. I’d grown so comfortable working with Cherice that I was a little hesitant to reach out and move to someone new. I gave Rukiya a call. “Grand rising!” she greeted me over the phone. I paused. “Come again?” I said. “Oh I say that instead of Good Morning” she said, “it really greets the day.” I knew I was going to like her. I’d gathered another set of sewing machines to deliver to New Orleans and was planning my next trip. This time instead of weaving my way to the Guardians’ Institute, adjoining Cherice’s mother’s home, I’d be finding a new spot. “Just head over to A.L. Davis Park!” Rukiya advised. We decided on a time and date and the plan was set. I threaded the truck through over the patchwork of streets into the Uptown neighborhood. The park opened out to my right. Up ahead, on the sidewalk, I could see two figures. 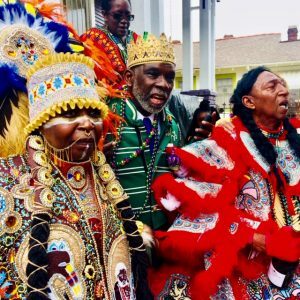 Queen Rukiya with her beautiful long hair, dressed in a brightly colored cloak stood next to Chief Howard, tall and regal. When I stepped out of the truck and approached them, Howard’s stoic face broke into a beautiful smile. The three of us sat at the park that day at a table in the sun, handing out sewing machines and getting to know one another. Since then, we’ve worked together on several distributions. 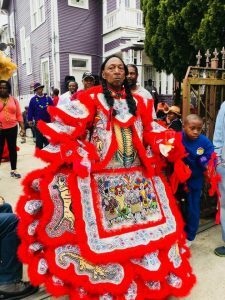 On my last few visits I’ve watched the progress of the Center for the New Orleans Mardi Gras Indian Council, the brainchild of Chief Howard. The Center, situated in a renovated double shotgun house, will be a collaborative space, offering meeting rooms as well as gathering space and even a sewing classroom. 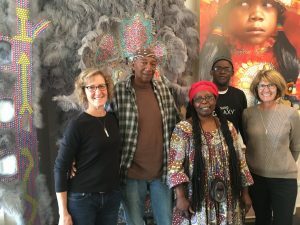 Rukiya plans to offer sewing classes, focusing on Mardi Gras Indian traditions. I was all over it, offering a set of sewing machines to outfit the sewing room. We are delivering those machines on this trip. Collaborating with the Church of Yoga, we’ll do a benefit class while we’re here to raise money for any other supplies Rukiya might need to make the sewing room the gem its meant to be. And on Tuesday night, when the sun sets over the city, the yoga students have gone home, and people start turning on their lights for the evening, we’ll step out and make our way into the half light. St. Joseph’s Day, the third of the three days Indians come out wearing their suits, this is the most mysterious. In the darkness, Indian “gangs” roam the streets in search of other “gangs”, meeting them with rituals that are a secret language to the Indians, greeting each other and sizing up the others’ suits. We’ll look around. We’ll listen for the drumbeats. And we’ll stand in awe.